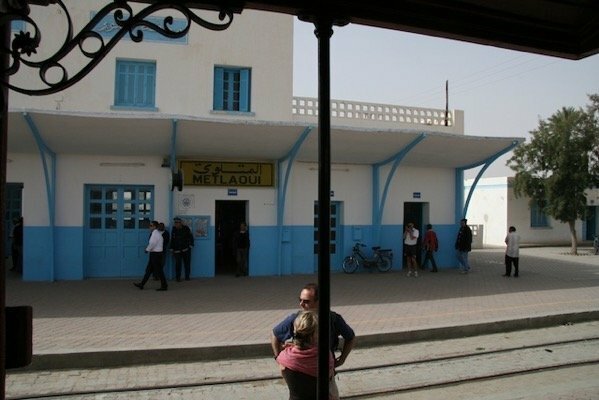 A great trip for those wanting to escape from the summer heat of Tunisia’s cities to the cooler Atlas Mountains in southern Tunisia is to ride on the Red Lizard train, known locally as Le Lezard Rouge. 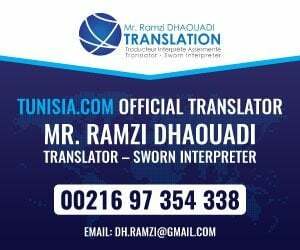 It was given as a gift by the French in 1940 to the Bey of Tunis for him to travel conveniently from Tunis to his summer palace in Hammam Lif. 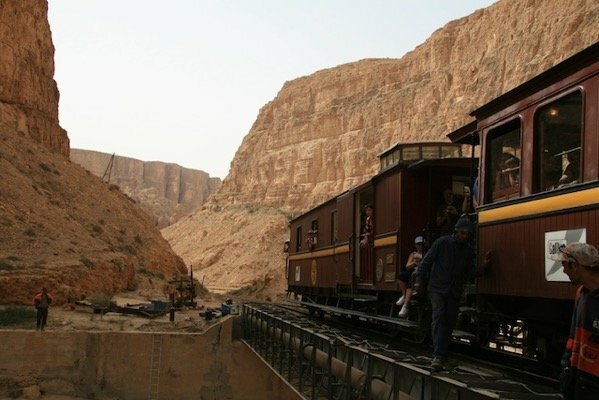 In 1995, the train was refitted by the national railway company and now carries tourists in style from Metlaoui through the impressive Seldja Gorge to Redeyef. It still runs daily, except Saturdays, during the summer months from June to September. This lovely historic train, in Belle Époque style, is prettily painted red with yellow trim and logos. This is certainly one of the most spectacular and memorable rail trips one can take. 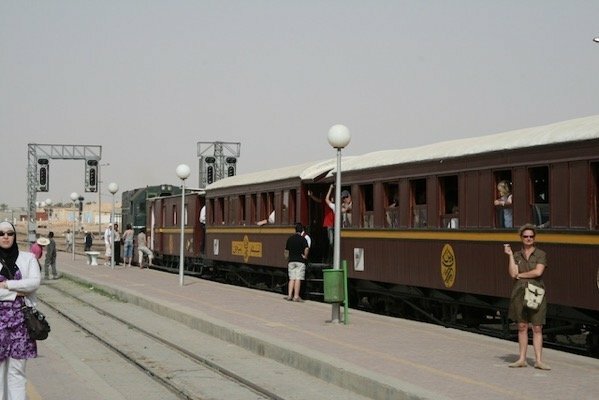 Although the ancient railway carriages are an attractive sight, the real attention-grabber is the desert scenery along the way. The destination, the Seldja Gorge, is also a marvellous natural formation to experience. 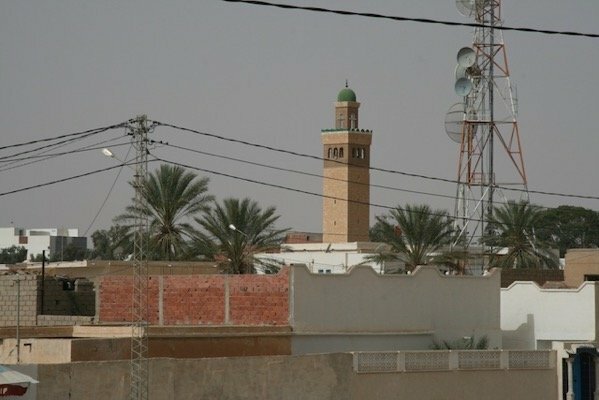 The train should depart from Metlaoui, which is about 40km (26 miles) northeast of Tozeur, at 11am daily but this is sometimes not the case and patience must be exercised. Sometimes the train needs mechanical attention before leaving, but mostly it simply waits until sufficient numbers of passengers have arrived and then it leaves. The exciting journey, which feels more like a trip in the Wild West than in North Africa, takes about 45 minutes each way as it journeys along the old mining track between Metlaoui and Redeyef. It winds its way along the mostly dry riverbed of the Oued Seldja through some of the most amazing pink and red rock formations. The rocks take on all shapes and sizes and the rock strata clearly shows the massive upheaval of the layers or rock as the mountains were formed by massive natural forces. Occasionally in the bottom of the gorge, there are small streams which support grasses, greenery and some small shrubs, but mostly the area is a dry, arid desert of rocky mountains alternating with flat plains. 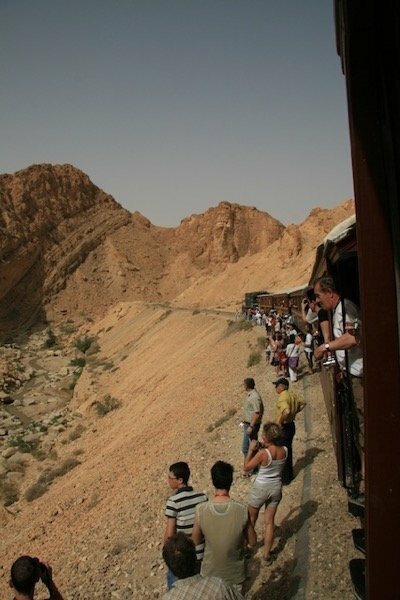 The purpose of the Red Lizard train journey is purely to enjoy the scenery and the desert highlights along the way, so it makes several stops for passengers to disembark and take pictures. The train edges its way through narrow passages and tunnels dug out of the local pink rock along the journey. The sights can be enjoyed from the open windows and doorways which are guarded by wooden gates. The train rolls sedately through plunging gorges and past oases and sheer rock faces. It stops at its final destination in the middle of a rocky desert, a short walk from the spectacular gorge carved out long ago by the River Seldja. The Seldja Gorge is a well-known attraction and a trip of the Red Lizard Train is definitely the easiest way to visit it. 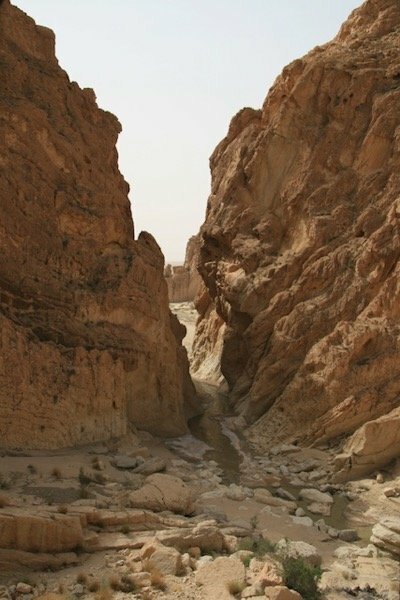 Further on, although not accessible by the train, are the small desert oasis towns of Chebika and Tamerza, which also have impressive gorge formations. 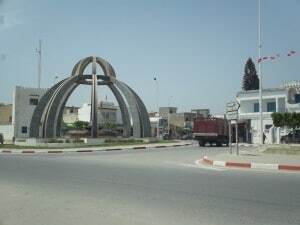 The town of Metlaoui is a mining and phosphate town, as can be evidenced from the piles of spoil heaps that abound in the area. The pink mountains in this area, which make the scenery so pretty, are rich in phosphate and minerals which are extracted by local mines. It was a Frenchman, Phillipe Thomas, who discovered the rich deposits of phosphates here at the end of the 19th century. 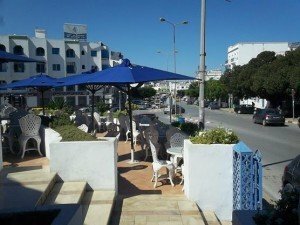 At first, his discovery was met with cool disregard by the local administrator, but today these deposits are one of Tunisia’s most important exports and sources of income. *A must do when in this area. *Take lots of water as the trip is quite long. *Note that the best photos are taken from the ends of the carriages and there is competition to do this so hold this in mind before packing the telephoto lens. *Seating is limited so have a rest before the trip if you are easily worn out. *We took a baby on the trip this was a mistake as would children under 5 as hot and they may find it boring unless they like this kind of trip.